After running a half-day performance consulting workshop last week I’ve realised that there is a critical question missing from this reflection formula. The purpose of the workshop was to define current performance gaps in an area, desired future state (desired behaviours), identify causes of the gap and identify potential solutions. 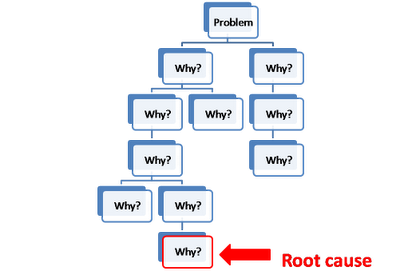 We used the ‘5 Whys’ technique to explore root causes of the gap – asking ‘Why’ a problem is occurring, then iteratively asking ‘Why’ again until you reach the root cause of the problem and can identify a counter-measure to prevent it recurring. There were some obvious elements of the solution identified before we got into 5 Whys – like improving processes and tools, updating role descriptions, standardising reports and review processes, and developing knowledge and skills. However, when we started asking ‘Why’ the desired behaviours might still not materialise despite having great processes, tools, reports, reviews, role clarity and skills in place, we delved into underlying factors that need to be addressed. Factors such as a short term focus on operational KPIs, conflicting KPIs, ‘fire-fighting’ being recognised and celebrated but not investments in capability building, teamwork, communication, and engagement. ‘Why’ was probably the most useful question asked during the workshop, leading to deeper insights and the potential for higher impact solutions. Now What? (Potential solutions – including measures to prevent recurrence of root causes). I shall apply this updated formula to a challenge I am having with my personal organisation that I recently reflected on using ‘5 in 5’ and post a comparison of the identified solutions.